What is ByMA and how does it work? 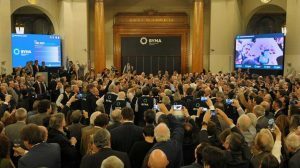 In an article written by Christian Atance, for Apertura, on November 24, managing director of Cefeidas Group, Santiago Chaher commented on Bolsas y Mercados Argentinos (ByMA) and its potential based on Brazil´s Novo Mercado as a model. General Secretary Luis Alvarez also commented on the collaboration between the National Securities Commission and Cefeidas Group. “Hace 10 meses que estamos trabajando con Cefeidas Group, un estudio que también asesora a la Comisión Nacional de Valores (CNV)”, señala Luis Álvarez, secretario General de la entidad que vio su luz a comienzos de año. “We have been working with the Cefeidas Group for 10 months, a study that also advises the National Securities Commission (CNV),” said Luis Álvarez, General Secretary of the entity that began at the beginning of the year. To read the full article in Spanish, please click here.